It might not be as well known as Cirque of the Towers, but it's certainly close in terms of quality. This 12.4-mile loop features a lot of elevation and an equal amount of stunning scenery. Hanging Canyon is like a miniature Cirque of the Towers without the three-hour drive and with only half the hiking. One-way, it's about five miles and 3,000 vertical feet. Crunch these numbers and you'll figure out the trail is fairly steep. For as scenic and accessible as it is, it’s quite possible you’ve never heard of Hanging Canyon. You’ve certainly never seen any mention of it on any trail signage. There is no maintained trail up it. But, as far as non-maintained trails in the park go, Hanging Canyon’s is one of the better ones. Because the trail is non-maintained, as you walk up the first 1,000 vertical feet, there is some deadfall to make your way over. Not so much as to get annoying though, as only a couple of the downed trees require more than a step-over. So how to find your way to the Hanging Canyon trail? Start at the easternmost String Lake parking area and follow the signs for the Jenny Lake west boat dock and Cascade Canyon. Don’t confuse the canyon directly in front of you with Hanging Canyon; that's Laurel Canyon-- which is another fun exercise in exploration, but is a better winter destination than anything else. Hanging Canyon is the one to the south. Continue around the western shore of Jenny Lake until you cross a series of three wooden bridges. The last one has a little step down. It should take you about 20-30 minutes. You’ll see another bridge about 150-feet ahead. If you cross that bridge, you’ve gone too far. Between the step-down bridge and the fourth bridge, there’s a sizeable dead tree on your right (west). Just north of the tree’s base, there’s a semi-circle of rocks. 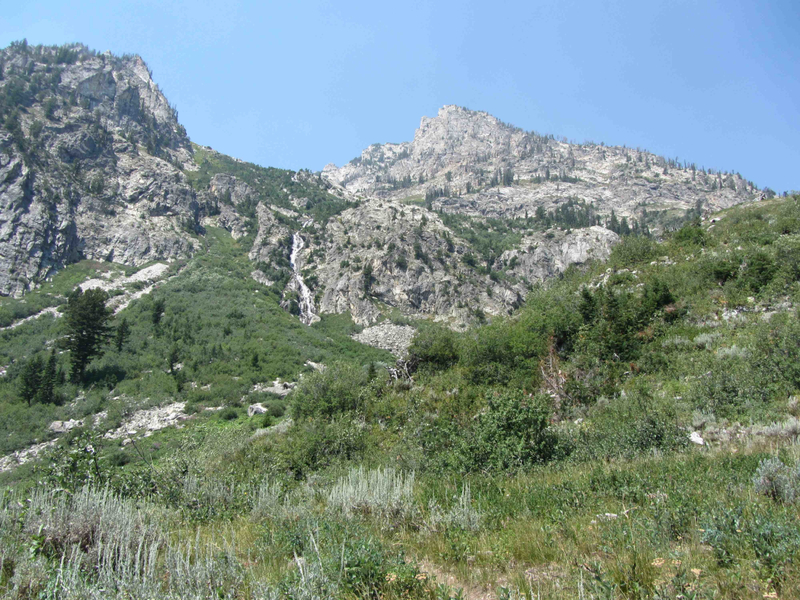 Look up from the rocks and you’ll see the trail that will take you up Hanging Canyon. It might not sound this way, but I swear you can’t miss it! The first 1,000 feet of climbing switchback through forests and open areas of come-and-gone wildflowers. This is the least-steep section of trail. The middle 1,000 feet track closer to the waterfall and stream, which drain from the canyon’s lakes. Things start getting steep in here. And then the final 1,000 feet of climbing gets into some scree fields … and, during the heart of summer, the best wildflowers of the hike: paintbrush, columbine, and all sorts of others. You can walk past the lowest of Hanging Canyon’s lakes, Arrowhead Pool, without noticing it. You can’t miss the second lake though, as the trail winds around its northern shore. It's called Lake Ramshead. You might be tempted to stop here, but please continue on. Lake of the Crags is only five minutes further and a hundred times more picturesque. There are few places, even within Grand Teton NP, that make you feel more in the mountains than Hanging Canyon, between Cascade and Paintbrush Canyons above the western shore of Jenny Lake. From Trimble Outdoors: "From Jackson, go north 12 miles; turn left on Teton Park Rd. 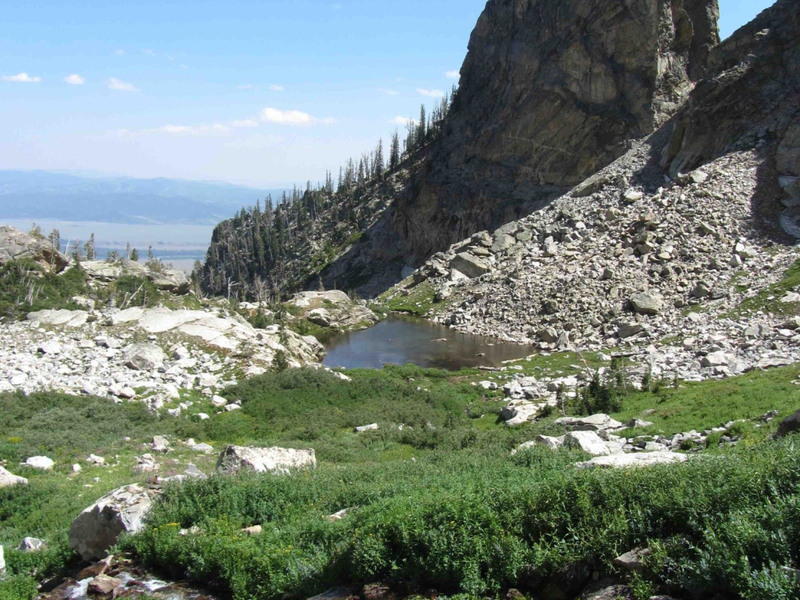 In 7.9 miles, turn left into the parking area near Jenny Lake Campground."